Every where your head turns there is a magazine, model, or TV show teaching your daughter the exact opposite of your “version” of modesty. When it comes to modesty, the one person she is going to learn this trait from is you! If you want to teach your daughter about modesty, it’s best to put a few rules in place. This isn’t an area you have to go crazy in, but setting up boundaries can help your daughter know how to dress. Here are a few examples. Shirts should cover the cleavage area. Skirts and shorts should cover the buttocks area and part of the leg. Swimming suits have to be one piece or a tankini. Keep in mind that these are just examples and you have to see up boundaries that are right for your own daughter. The way you teach a teen about modesty and the way you teach a young five year old girl about modesty are completely different. You’ll want to make the conversation you have with them relatable to their age group. As I mentioned before, some girls learn by watching and not by doing. When a teachable moment comes along, make sure you are prepared to help your daughter learn a lesson from it. This can be a tough one because you don’t want to be harsh. It’s important to teach that modesty can help teach self respect. 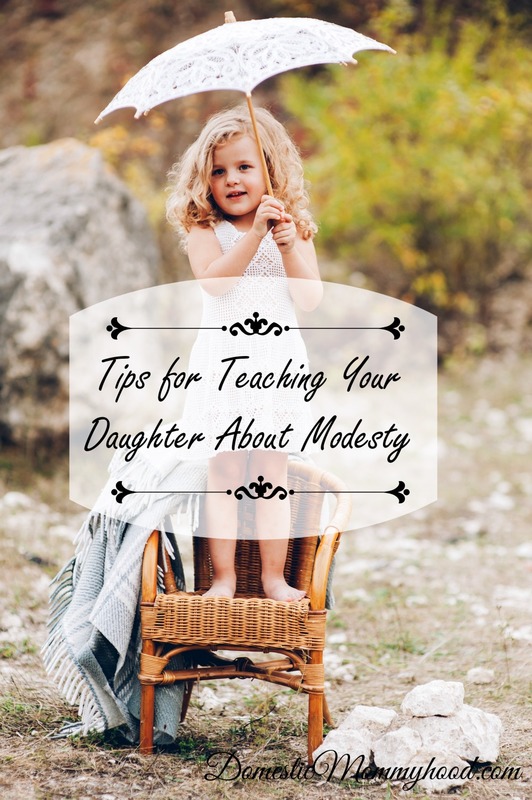 What are some ways you teach your daughter about modesty?